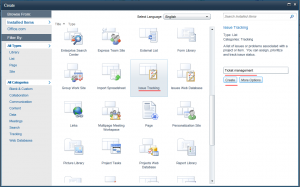 Issue Tracking is an out-of-the-box solution provided by Sharepoint to track issues or problems with a project or item. We can assign issues to users, prioritize and track status. Sharepoint allows user to track, record, document their issues or problems, it also alerts the user according to issues priority. 1. 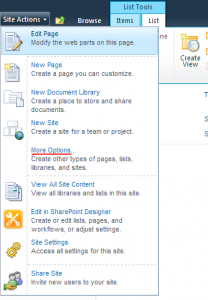 Open your Sharepoint site. 2. Click More Option from Site actions, select Issue Tracking. 3. 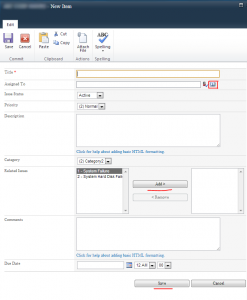 Click Create button to create Issue Tracking list. 4. We can add issues by clicking on Add new Item. 5. 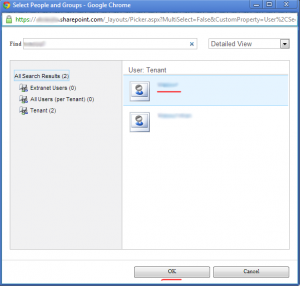 Select Assign To people from people picker. 6. Find users in the people picker. 7. Select other option like priority, category & related issues. 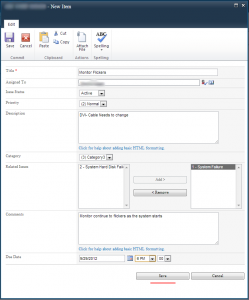 SharePoint Issue Tracking allows end-users to create and manage their Issues or Problems in one place and let users to track and separate issues according to its category. It consists of features like sending alerts to users assigned to via priority and category wise etc. How can we hard code the ‘Assigned to’ field? If I have to assign all the issues to one single person how can I do that?